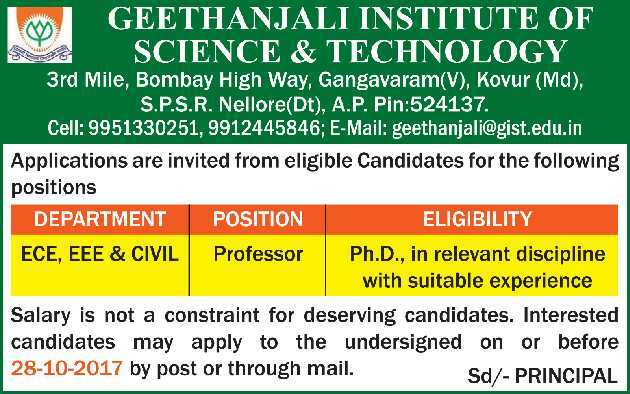 Geethanjali Institute of Science and Technology, Nellore advertised in THE HINDU Opportunities newspaper for the recruitment of Teaching Faculty- Professor jobs vacancies. Interested and eligible job aspirants are requested to apply on or before 28th October 2017. Check out further more details below. About College: Ushodaya Educational Society, with decades of experience and expertise in running educational Institutes established Geethanjali Institute of Science and Technology in order to provide quality Engineering and Technical Education to the rural and underprivileged lot on par with the creamy layer of society. The College is well connected by road with NH5 at 3 KM and Mumbai State High way at about 500 Meters away. The nearest Railhead is just 5 KM away. A network of roads and a variety of transport options at regular frequency, make it accessible from different places. How to Apply: Interested and eligible candidates are requested to send their updated CV along with copies of certificates and recent PP size photo to the following postal address or email address. Reference: Advertisement on THE HINDU Opportunities newspaper dated 18th October 2017.